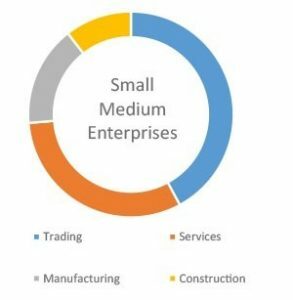 The SME’s are active in the trading, services, manufacturing, Real estate and contracting sectors. The major challenge faced by any SME in the current competitive and the ever dynamic business world is to have a resident system to provide insightful business information to make the right decision at the right time hence, increasing efficiency, productivity, and profitability. An ERP software can empower an enterprise by integrating the entire aspect of business activities across departments, warehouses, branches and locations under a common platform. The integrated solution approach of Realsoft ERP tremendously improve the communication and efficiency among various departments, staff, suppliers, vendors, and customers hence offering an unparalleled competitive advantage to the enterprise. The ERP system connects all the major business functions namely Manufacturing, Sales, Procurement, Inventory, Distribution, Human Resource, CRM, Contracting, Real Estate, Supply Chain Management, Project Management, and Finance etc. based on the nature and scope of the business. The Realsoft ERP system provides data integrity by offering real-time data availability across the enterprise. A high level of process improvements, improved efficiency and control can be achieved with the use of Realsoft’s efficient workflow management system. Enterprises that fall behind to adopt an ERP system run the risk of being overtaken by competition or fail to achieve the desired profitability. The successful organizations are those that make the decision, set the right expectations and implement the system in a swift and structured approach. A stable and a robust system does not need a huge capital expenditure and will deliver a quantifiable return on investment within short time periods. A well-structured ERP with Work Flow Management system in place will minimize the IT spending and hence it will increase the ROI on ERP investment. To know more about how Realsoft ERP can help benefit your business, please write to us at [email protected] or submit the contact form in the link http://www.coralme.com/contact and we will get back to you.